Handcrafted in the US from premium pine and durable silver or black metal hoops, these displays are proven to get noticed and elevate your brand. 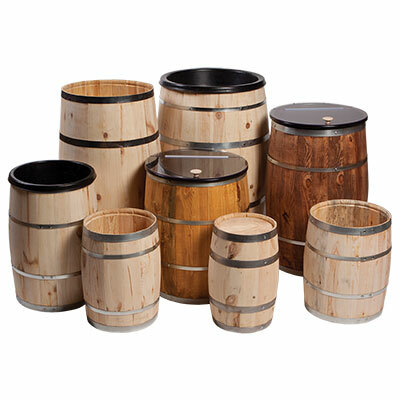 Customize the perfect barrel to use as a pedestal or functional display filled with products. Handcrafted from premium pine and outfitted with plastic liners and spigot, our dispensing barrels are perfect for serving lemonade, water, fine wine and specialty cocktails. We'll customize your dispensing barrels to add some wow-factor to your environment. Our team can work with your designs to develop a completely customized piece utilizing our in-house capabilities. Or, choose from a variety of our premium pine barrels, which you can then customize with graphics, stain or other finishing.